Not for profit organisations operating across multiple locations face many of the same challenges a for profit organisation would, except they generally lack the funding and dedicated personnel to support many of the things for profit organisations are able to finance. These not for profit virtual teams must use their scarce resources of personnel and funds to deliver some of the functions a for profit would pay to have personnel dedicated to. Generally a not for profit will be either a volunteer organisation or a charity, where the income collected is used principally to forward the aims of the organisation. This leaves little, if any money, to pay for personnel development or the employment of specialists. These not for profit organisations are also typically staffed by a combination of volunteers and paid personnel, with most of the people drawn to the higher goals of the organisation, often without some of the skills needed to operate in distributed team environments. Not for profit personnel are typically passionate about the organisation’s cause and will dedicate many hours of their own time to the aims of the organisation, but again their available hours are frequently dictated by the available time outside of their day job. With limited funding it is often difficult for not for profit organisations to access the tools needed to operate complex virtual teams. They must spend their resources sparingly on things they need and make do with whatever they are able to find. This scarcity of funding often limits them to using free communication tools like Skype, rather than higher spec’d video conference facilities. It also leaves them reliant on learning through experience rather than being able to pay for specialist training. Coupled with the limited access to tools and training, not for profit organisations often either have a high turnover of volunteers as individual’s lives progress and their circumstances change, limiting their ability to participate, or they have stagnant pools of volunteers who may not be aware of many of the evolving ways they could become a more effective organisation. This real or potential high turnover or stagnation of personnel means that the costs of training can be high and the returns to the organisation relatively low. Additionally, many personnel in these NFP’s are attracted to the cause, and will often work for free or for little financial reward. As such, linking the performance of personnel to any form of payment is therefore very difficult, meaning that it is not possible to manage individuals performances, select for skills or offer tailored training, as the personnel may be in roles for which they are less suited but which they are passionate about. Faced with the challenges set out above, of a workforce largely made up of volunteers with a passion for the organisation’s cause and either a high turnover or a stagnant pool of personnel, the challenge for not for profit virtual teams is how to make the best of what they have. Codify their operational processes – Producing standard documentation that sets out how things are done will help any organisation with a high turnover of personnel retain some of its ability as personnel leave and are replaced. Having manuals and practices means that the next person can pick up reasonable easily when moving into a new role. Put in place solid and effective succession planning – having a realistic succession plan means that the organisation is able to bring replacement personnel up to the required skill level and level of contacts before they need to assume full responsibility for their new role. A succession plan also allows new people to see a future for themselves in the organisation and for those already in roles to see an exit or career progression. Keep the organisation’s goals realistic – I imagine that every not for profit organisation starts out with very grand visions but in reality is able only to deliver a relatively small part of that initial vision until it has grown to a size large enough to take on the grand goals, remaining realistic will keep the goals achievable and give the membership greater satisfaction. Keep it simple – keeping the not for profit virtual team structure simple and in line with realistic goals will mean it is better able to focus on its prime objectives rather than become engrossed in operational issues, as the organisation hopefully grows it can add functions and locations as resources allow. Seek help – A not for profit needs to be comfortable looking for assistance in any area it needs it, whether that is seeking out an advisory board, finding mentors or accessing for profit organisations tools and skill pool to help it function within its own budget. Many individuals who see value in the goals of the not for profit but who themselves have limited time will be happy to pitch in where they can. With a considered approach, a not for profit virtual team should be able to function as effectively as a for profit, they need to stay within their abilities and plan for the future but with proper planning that is completely possible. 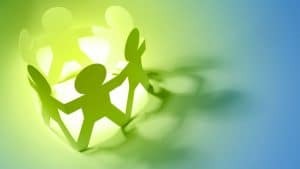 Additionally, many Not For Profit organisations have one thing many for profit organisations lack, and that is staff passionate about the outcomes and who will go the extra mile to help out their virtual colleagues. This passion and enthusiasm will often help to balance the capabilities of a not for profit against a for profit business.